Anyone who missed these two years back when they were initially published and distributed around Pittsburgh, PA, no has a second chance! 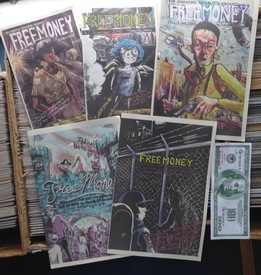 In conjunction with the release of the long awaited sixth issue of of Free Money on 22 September 2018, Mr. McCloskey has put together some sets of the first five issues for us to offer here. Each issue is in full color, 24 pages printed on newsprint, old school style, with no staples. So, 120 pages total! And we'll throw in a copy of #6 FREE with any and all orders of this set.